I recently started blogging, as I felt the need for more awareness around charities in South Africa. All child focused charities are connected in some way, but nobody knows where to go when you’d like to find out who to help. My aim with The Grace Factory blog was to create awareness, showcase other charities and inform SA mommies of cool events where you can support organisations who do great work. 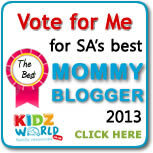 The blog proved to meet its main objectives, as so much wonderful feedback has been received from SA moms, it is AMAZING, and sometimes breath taking, when you see how generous moms can be. I do guess that when you have a child and you see how blessed you are, most people give thanks by giving to others…. But yesterday, when I clicked on the link sent by Kidzworld to see who was in the top 10, I NEVER expected to see our name there. I am completely overwhelmed by the fact that we got nominated and really want to thank everyone who nominated us. Of course we would LOVE to win, but if you’d like to vote for us AND you think we’re a WORTHY winner, please click the button below. Best of luck to the other 9 contenders, you all ROCK!! ← Walk for a good cause!! !